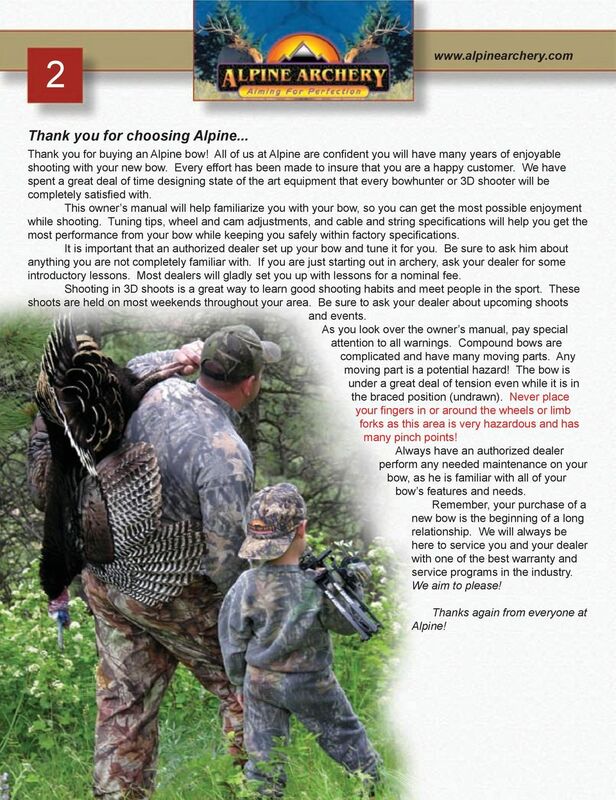 Download "Alpine Archery Owner s Manual"
2 2 Thank you for choosing Alpine... Thank you for buying an Alpine bow! 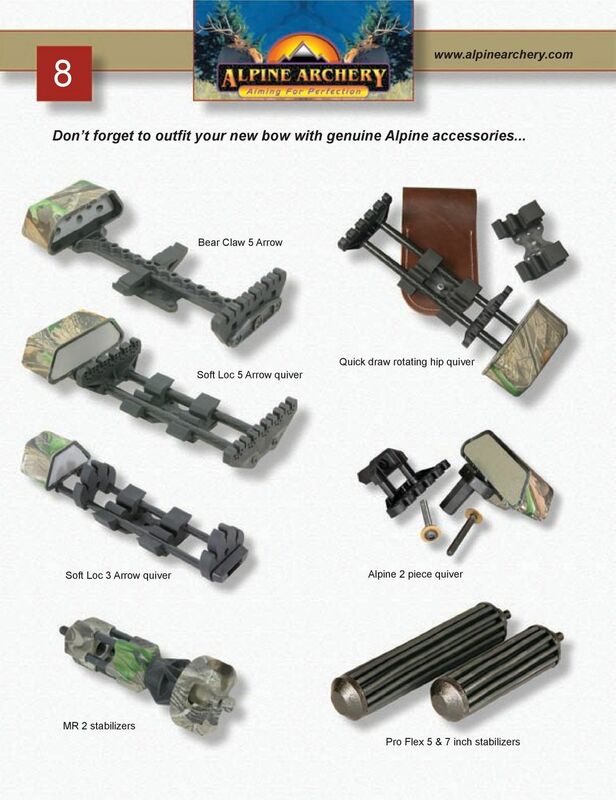 All of us at Alpine are confident you will have many years of enjoyable shooting with your new bow. Every effort has been made to insure that you are a happy customer. We have spent a great deal of time designing state of the art equipment that every bowhunter or 3D shooter will be completely satisfied with. 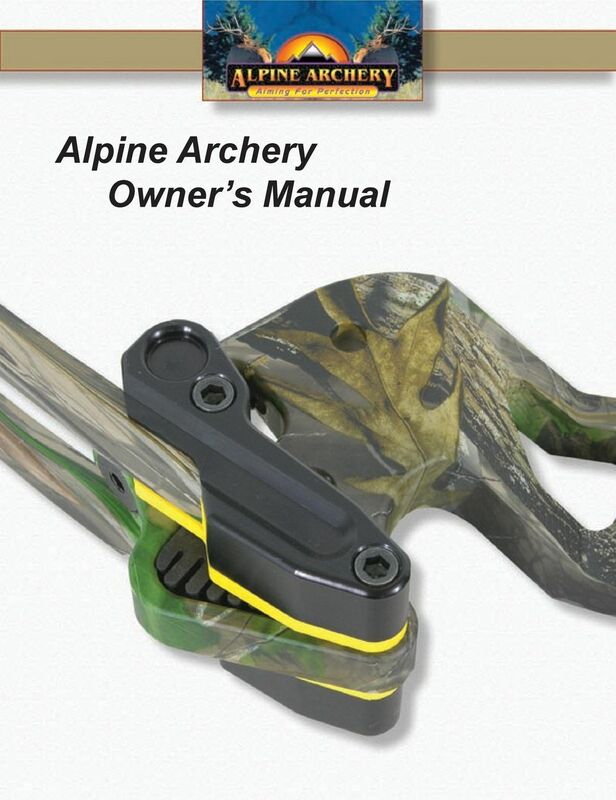 This owner s manual will help familiarize you with your bow, so you can get the most possible enjoyment while shooting. 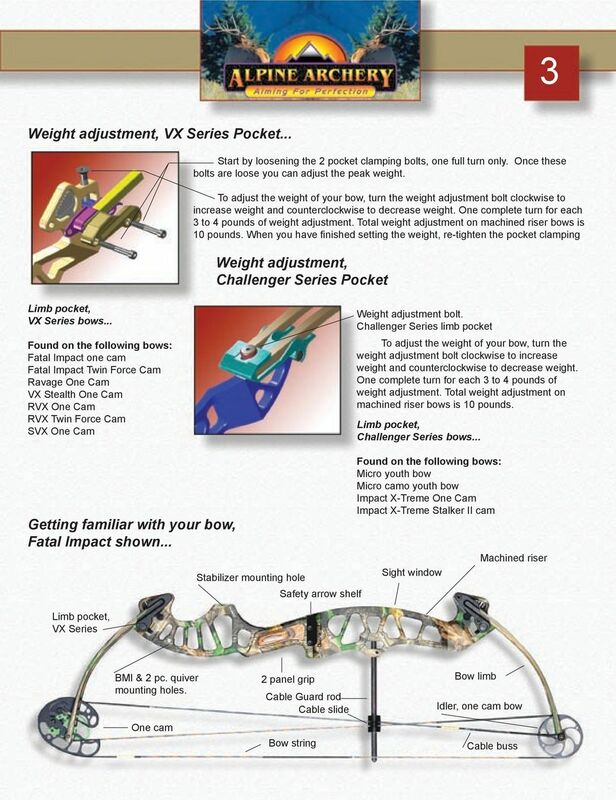 Tuning tips, wheel and cam adjustments, and cable and string specifications will help you get the most performance from your bow while keeping you safely within factory specifications. 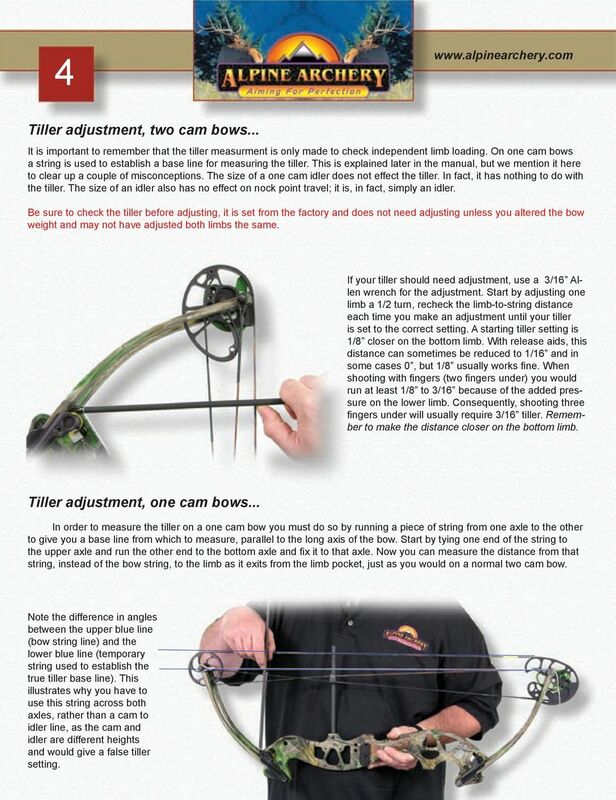 It is important that an authorized dealer set up your bow and tune it for you. Be sure to ask him about anything you are not completely familiar with. If you are just starting out in archery, ask your dealer for some introductory lessons. Most dealers will gladly set you up with lessons for a nominal fee. Shooting in 3D shoots is a great way to learn good shooting habits and meet people in the sport. These shoots are held on most weekends throughout your area. Be sure to ask your dealer about upcoming shoots and events. As you look over the owner s manual, pay special attention to all warnings. Compound bows are complicated and have many moving parts. Any moving part is a potential hazard! The bow is under a great deal of tension even while it is in the braced position (undrawn). Never place your fingers in or around the wheels or limb forks as this area is very hazardous and has many pinch points! Always have an authorized dealer perform any needed maintenance on your bow, as he is familiar with all of your bow s features and needs. Remember, your purchase of a new bow is the beginning of a long relationship. We will always be here to service you and your dealer with one of the best warranty and service programs in the industry. We aim to please! Thanks again from everyone at Alpine! 4 4 Tiller adjustment, two cam bows... It is important to remember that the tiller measurment is only made to check independent limb loading. On one cam bows a string is used to establish a base line for measuring the tiller. This is explained later in the manual, but we mention it here to clear up a couple of misconceptions. The size of a one cam idler does not effect the tiller. In fact, it has nothing to do with the tiller. The size of an idler also has no effect on nock point travel; it is, in fact, simply an idler. Be sure to check the tiller before adjusting, it is set from the factory and does not need adjusting unless you altered the bow weight and may not have adjusted both limbs the same. If your tiller should need adjustment, use a 3/16 Allen wrench for the adjustment. Start by adjusting one limb a 1/2 turn, recheck the limb-to-string distance each time you make an adjustment until your tiller is set to the correct setting. A starting tiller setting is 1/8 closer on the bottom limb. With release aids, this distance can sometimes be reduced to 1/16 and in some cases 0, but 1/8 usually works fine. When shooting with fingers (two fingers under) you would run at least 1/8 to 3/16 because of the added pressure on the lower limb. Consequently, shooting three fingers under will usually require 3/16 tiller. Remember to make the distance closer on the bottom limb. Tiller adjustment, one cam bows... In order to measure the tiller on a one cam bow you must do so by running a piece of string from one axle to the other to give you a base line from which to measure, parallel to the long axis of the bow. Start by tying one end of the string to the upper axle and run the other end to the bottom axle and fix it to that axle. Now you can measure the distance from that string, instead of the bow string, to the limb as it exits from the limb pocket, just as you would on a normal two cam bow. Note the difference in angles between the upper blue line (bow string line) and the lower blue line (temporary string used to establish the true tiller base line). This illustrates why you have to use this string across both axles, rather than a cam to idler line, as the cam and idler are different heights and would give a false tiller setting. 5 5 Cam timing, two cam bows... Setting the timing is easy, just draw your bow and have a friend look at the cams at full draw. The cams should roll over at exactly the same time. Start by looking at the take-up side of the cam (the smaller side). You will see the buss cable or string leaving the cam and going to the limb on the other end of the bow. There should not be a gap between the string and the groove on the base cam when the cam is at full draw. Any gap here will indicate that the cams are out of time. 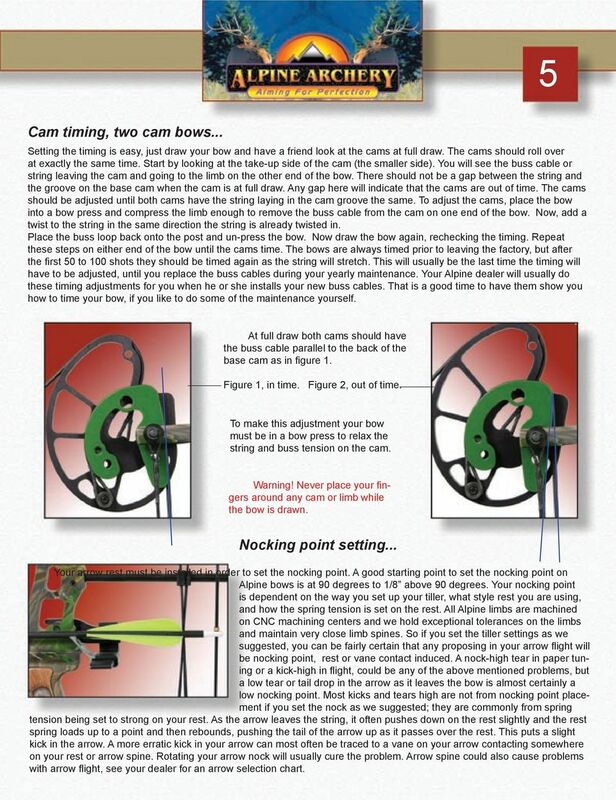 The cams should be adjusted until both cams have the string laying in the cam groove the same. To adjust the cams, place the bow into a bow press and compress the limb enough to remove the buss cable from the cam on one end of the bow. Now, add a twist to the string in the same direction the string is already twisted in. Place the buss loop back onto the post and un-press the bow. Now draw the bow again, rechecking the timing. Repeat these steps on either end of the bow until the cams time. The bows are always timed prior to leaving the factory, but after the first 50 to 100 shots they should be timed again as the string will stretch. This will usually be the last time the timing will have to be adjusted, until you replace the buss cables during your yearly maintenance. Your Alpine dealer will usually do these timing adjustments for you when he or she installs your new buss cables. That is a good time to have them show you how to time your bow, if you like to do some of the maintenance yourself. At full draw both cams should have the buss cable parallel to the back of the base cam as in figure 1. Figure 1, in time. Figure 2, out of time. 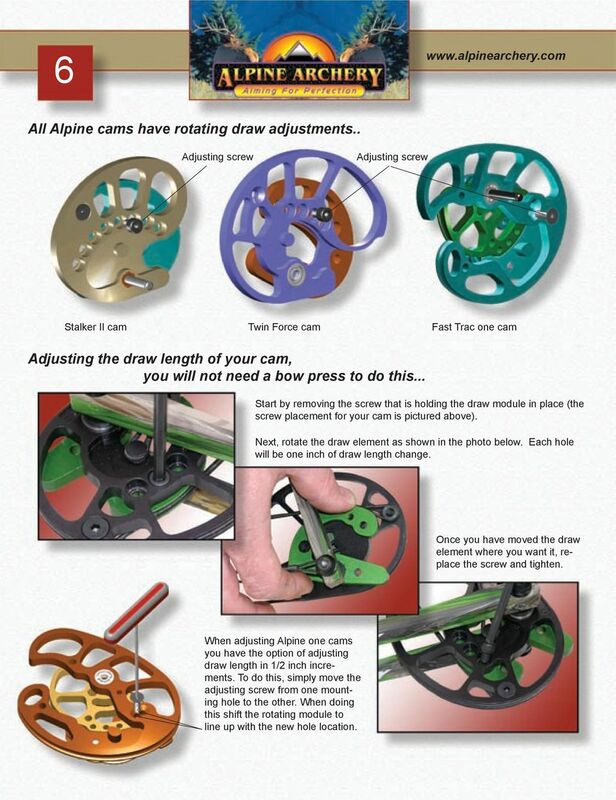 To make this adjustment your bow must be in a bow press to relax the string and buss tension on the cam. Warning! Never place your fingers around any cam or limb while the bow is drawn. Nocking point setting... Your arrow rest must be installed in order to set the nocking point. A good starting point to set the nocking point on Alpine bows is at 90 degrees to 1/8 above 90 degrees. Your nocking point is dependent on the way you set up your tiller, what style rest you are using, and how the spring tension is set on the rest. All Alpine limbs are machined on CNC machining centers and we hold exceptional tolerances on the limbs and maintain very close limb spines. So if you set the tiller settings as we suggested, you can be fairly certain that any proposing in your arrow flight will be nocking point, rest or vane contact induced. A nock-high tear in paper tuning or a kick-high in flight, could be any of the above mentioned problems, but a low tear or tail drop in the arrow as it leaves the bow is almost certainly a low nocking point. Most kicks and tears high are not from nocking point placement if you set the nock as we suggested; they are commonly from spring tension being set to strong on your rest. As the arrow leaves the string, it often pushes down on the rest slightly and the rest spring loads up to a point and then rebounds, pushing the tail of the arrow up as it passes over the rest. This puts a slight kick in the arrow. A more erratic kick in your arrow can most often be traced to a vane on your arrow contacting somewhere on your rest or arrow spine. Rotating your arrow nock will usually cure the problem. Arrow spine could also cause problems with arrow flight, see your dealer for an arrow selection chart. 6 6 All Alpine cams have rotating draw adjustments.. Adjusting screw Adjusting screw Stalker II cam Twin Force cam Fast Trac one cam Adjusting the draw length of your cam, you will not need a bow press to do this... Start by removing the screw that is holding the draw module in place (the screw placement for your cam is pictured above). Next, rotate the draw element as shown in the photo below. Each hole will be one inch of draw length change. Once you have moved the draw element where you want it, replace the screw and tighten. When adjusting Alpine one cams you have the option of adjusting draw length in 1/2 inch increments. To do this, simply move the adjusting screw from one mounting hole to the other. When doing this shift the rotating module to line up with the new hole location. 7 7 Look your best in Alpine clothing... Alpine polar fleece jacket, comfortable, warm, and stylish.. for Alpine polar fleece vest, great in-between weather. Alpine polo shirts, casual short sleeve shirts with logo on chest and Team Alpine on sleeve. Alpine hats in camo or black. 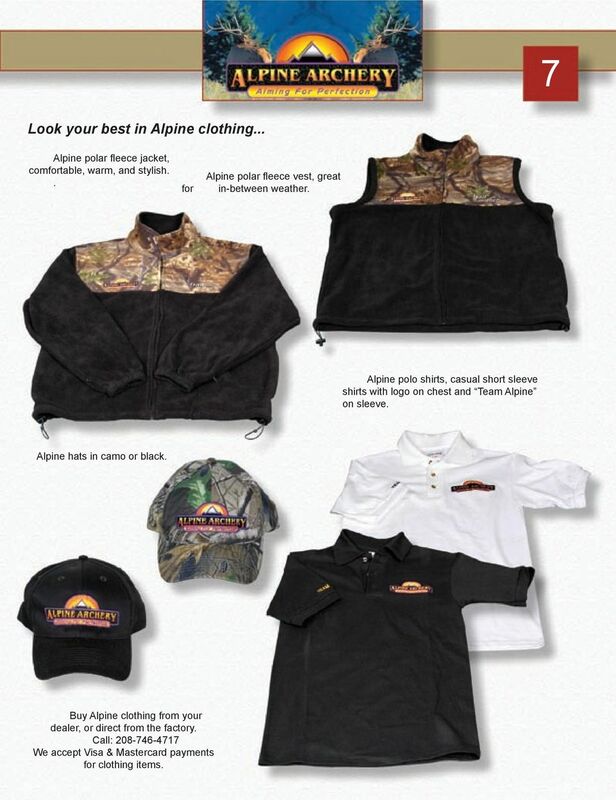 Buy Alpine clothing from your dealer, or direct from the factory. Call: We accept Visa & Mastercard payments for clothing items. Win & Win BOW. WIN & WIN Recurve Bow XPERT, INFINITE, EXFEEL, WINACT (25") Long Limbs Medium Limbs Short Limbs (70") 20. Kiitos, Contents. Part list. että valitsit Kickbike potkulaudan. That s Finnish as our scooters and means: Thank you, for buying Kickbike scooter. USER S MANUAL. Thank you for buying a Wide Body Boomerang Bead Loom. We re sure you re going to love working with this professional quality loom. Warning Do not proceed with this installation before reading the disclaimer at the end of this document.